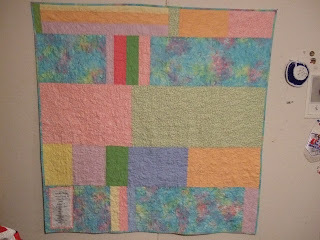 Here is a baby quilt I delivered today for my son's teacher and his wife. 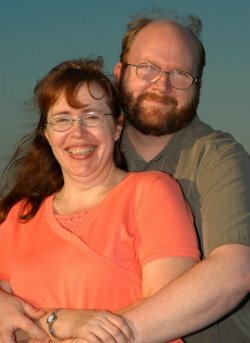 Their baby girl was born March 1st. 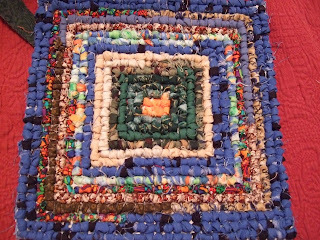 This is a planned bargello from Bonnie's Scrappy Bargello pattern. I have a patriotic one just waiting for border/backing/quilt machine! 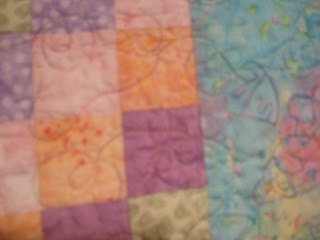 close up of quilting. (sorry about the blurry-ness). I just did a loop-de-loop. I hope you can see the close up of the pastel batik. I bought this fabric as least 4 times. I think this is the last of it...dogGONE it! typical of me..scrappy back. The solids were in the throw away pile at sewing class. I brought them home, washed them to take out the musty smell, and ironed them. They look so good with that batik! I hope they like it. My son's teacher is wonderful with him...he puts up with his very sarcastic wit! PRICELESS! Very pretty...I am sure she will love it for her baby. 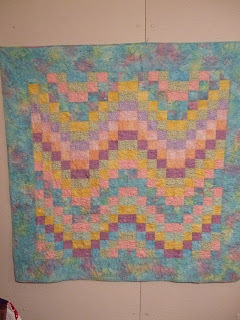 What a beautiful baby quilt! I love the colors. What a cute baby quilt! The colours are so soft! Thanks for sharing! Great job on the quilt and love the machine quilting! She will love it. Beautiful! I love the pieced back, too. that turned out wonderful! I really like how the colors flow in the bargello. Great job!